Every 15 minutes a child is abused in Australia. The rates of child abuse are increasing every year, and the numbers are frightening. In 2015-2016 there were 355,935 notifications of child abuse. This was an 8.1% increase from 2014-2015. 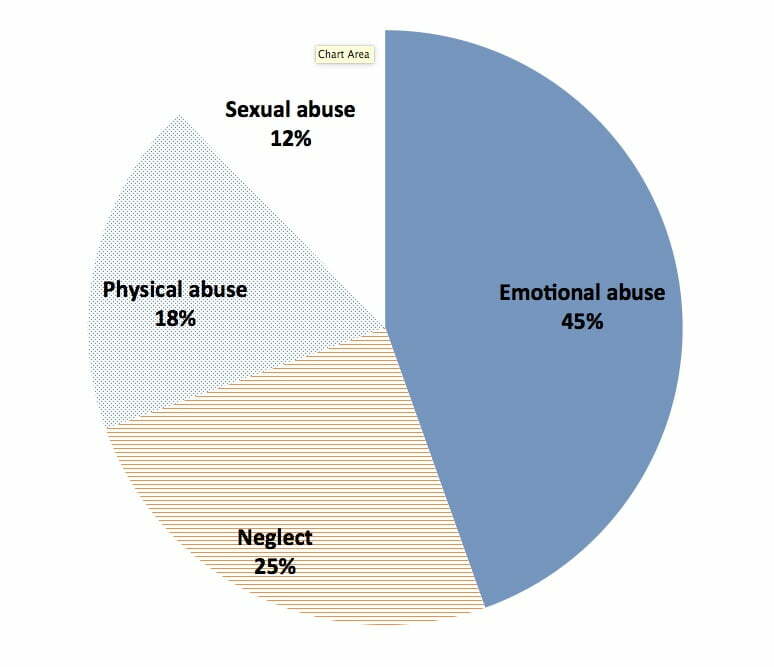 Of these cases, 45% were claims of emotional abuse, 25% were cases of neglect, 18% physical abuse and 12% sexual abuse. These are the number of reported cases. There could be thousands of additional cases which go unreported every year. The Royal Commission proved this – it can be years before abuse survivors come forward. The Australian Institute of Health and Welfare (AIHW) have reported that 45,714 children were the subject of substantiated abuse or neglect. 51% of these cases were girls. This number varies state to state, but across Australia girls were 16% more likely to be victims of abuse. This study also found indigenous children were 7 times more likely to have a substantiated claim of abuse or neglect. Infants under the age of 12 months were the most common age group being abused. These children are too young, and too isolated to notify authorities. There is no conceivable way a baby can alert others to their abuse. Children living in rural and low socio-economic areas are also more likely (16.2% & 35.7% respectively) to have a substantiated claim of abuse. Studies have shown 1 in 6 women were physically or sexually abused before the age of 15. This rate is 1 in 9 for men. What do these child abuse victims have in common? Other factors, including the child’s physical characteristics, social isolation, level of understanding of sexual behaviour (including sexual abuse) and personal safety, sexual orientation, high achievement and level of self-esteem. So what’s being done to reduce child abuse? There are studies being done to provide us with these numbers, but what these studies aren’t showing us is the true numbers of children being abused, and what’s being done. The study showed one in 32 Australian children received child protection services, with 75% of those children being repeat clients. This only demonstrates the continual failing of out of home care, and the failings of these protective services. The system is clearly broken if year on year, 75% of the children being studied continue to require child protective services. The Royal Commission made over 30 recommendations to improving out of home care for young Australians, as a result of hearing from 285 people under the age of 25. 35% of those young Australians were abused in out of home care. And of the 285 young Australians the Royal Commission heard from, 76.8% said the abuse described their well-being being impacted as a result of abuse. 90.9% of those individuals disclosed they experienced mental health issues. Child abuse is a parasite on a child’s life. Abuse survivors are having their futures torn from their grasp. They are more likely to experience isolation and mental health issues which impact their ability to create meaningful relationships and gain an education. Abuse can be generational, so it’s critical young people are given the support and resources required to ensure the safety of future generations. Australia needs to commit to improving the lives of these children. Without ongoing support and resources, more children are at risk of slipping through the cracks and not receiving the help they need. State governments need to commit to improving the lives of these young Australians by following the recommendations provided by the Royal Commission. If you know a child is being abused, contact one of the numbers provided in this resource.